As the leaves dance playfully to the earth and the slow tempo of summer quickly picks up speed and jolts us back to reality we are gently reminded that nature’s cycles are a reflection of our lives. Take time to appreciate the beauty that surrounds as you find pace in the cadence of the shifting season. In this issue, we recognize the excitement of change through the eyes of a Russian immigrant. Writer Heather Bode unpacks the ultimate details behind Andrei Shkurigin’s “American Dream” and how his idea of equality came full circle through the talents of his oldest daughter. In our “Memory Lane” department, we take a step back to the Cold War as Great Falls resident and retired Air Force Colonel, Lee Mongeon, recalls his flying career as a B-45 pilot in the Air Force 47th Bomb Wing. The competition heats up as we take a peek behind the scenes at the Great Falls Gymnastics Academy and discover some determined athletes who dedicate just as much time to mental toughness as they do to the skills they must master. Award winning builder, Tim Wilkinson takes us on a tour of his latest design that sits perched above the great Missouri and surrounded by the Little Belts and Highwood Mountains. Wilkinson is known for his stunning designs and this home is no exception with its amazing combination of rustic and modern elements that make for a dramatic profile at the top of Spring Tree Ridge. We delve into chronic pain and visit with a few patients whose quality of life was in shambles until they met Great Falls Clinic physician, Dr. Craig Sweeney. Montana FFA continues to set men and women on the path to lifetime agricultural careers. We dig up the dirt behind the prodigious organization and how it prepares students for successful careers and a lifetime of informed choices in global agriculture, food, fiber and natural resources systems. This is just a sampling of the stories we have prepared for your reading pleasure. 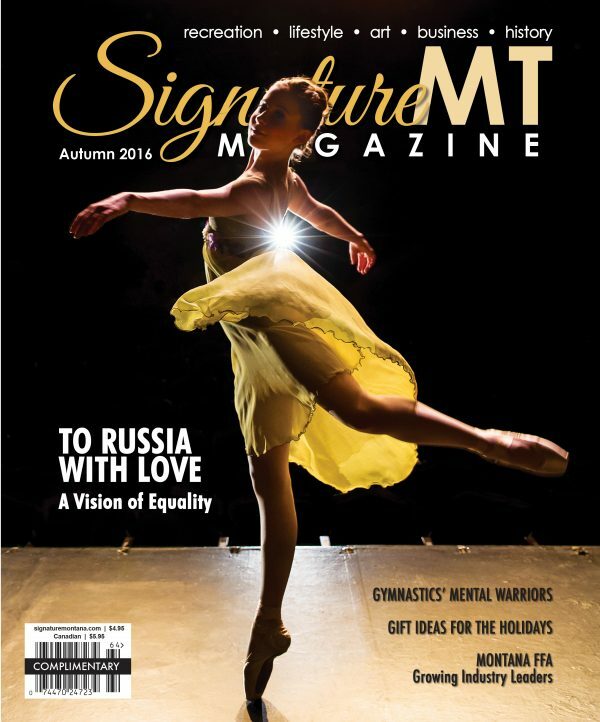 So… throw on the comfy cloths, arm yourself with a pumpkin spiced beverage and nestle up to that crackling fire because fall is here and so is another fabulous issue of Signature MT magazine.